Added on May 13, 2014 by Jessica Gath. For You I Feel Lucky is participatory. Your participation is integral to your attendance – and to the performance being able to exist at all. It is an evening crafted in celebration of and completely for you. In 1981 there was a serial radio program that was taped but rarely aired. The program’s leading lady, The World Famous Secretary, was at once professional and disarming. She made even the most mundane of her daily tasks entertaining for her listening audience. The show ran its course and its creator moved on to other projects. All that remained was a tape. Then even that disappeared. After twenty-eight years off-the-air, The World Famous Secretary is back; and this time she works for you. J: What kind of cake would you like for your birthday? B: The world's smallest cake. J: OK, but what KIND of cake would you like for the smallest cake to be? B: I don't know. What are my choices? J: Choose one of each of the following: chocolate or lemon? The concept of For You, Beautiful is to catalyze generosity in real time in people’s real lives. I invite attendees/participants to think of someone in their lives and to let that person know – this time in the form of a postcard stating "You may or may not know you have the most beautiful _________." For You, Beautiful works as a narrative with three stages. First, you are participating right now, as you read this, calling to mind the distinct beauties of some of the people in your life. The next stage of the work is you writing or filling out an internet form to send a postcard. You may do so here. The work ends with the recipients of the gift receiving them – whenever and wherever that may happen. Visitors to the gallery were encouraged to leave with at least one jar. Every atom belonging to me as sure belongs to you. Added on December 7, 2013 by Jessica Gath. And what I assume you shall assume,For every atom belonging to me as sure belongs to you. Another artwork in the vein of and inspired by Even the highest mind and most rarefied spirit exist in a body that is made of earth. Even the highest mind and most rarefied spirit exist in a body that is made of earth. Added on December 6, 2013 by Jessica Gath. "Even the highest mind and most rarefied spirit exist in a body that is made of earth." People lived on Earth for millenia before we were born and, grand or humble, left marks that influence our lives today. We owe our technology, our beliefs, our customs – our very bodies – to their lives, their work, their joys and suffering. Even the highest mind... is an homage to all who came before us and left behind wisdom that nourishes and teaches us; from this wisdom our own takes root and grows, for us and for those who come later. Added on April 15, 2012 by Jessica Gath. 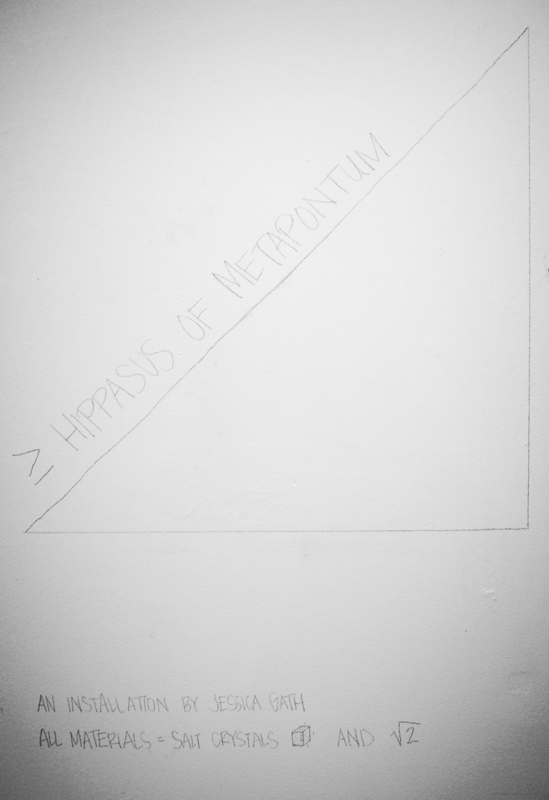 ≥Hippasus of Metapontum is an installation in the form of the √2 stenciled on the gallery floor in salt. The number, 1.4142..., begins at the gallery door and loops, ever tighter, as it draws nearer to the center of the gallery. I chose salt as my material because salt crystals are perfect squares and because Hippasus found his end among much salt. The installation asserts that this number (shown in the gallery to 159 digits) was, at his time and in his place, ≥ Hippasus of Metapontum. Added on May 15, 2005 by Jessica Gath. Added on February 15, 2004 by Jessica Gath. For years I have been investigating the body – exploring its surface, drawing it, painting it, replicating it – all in an attempt to capture a glimpse of a being’s own, particular numinous essence. I saw the human body and spirit as tightly-fused facets of one entity – the body as a spirit’s world all its own. Then I lived with death. With the sloughing off of flesh – the cutting away of insides and falling away of outside and daily disintegration of everything that remained. Before my eyes the connection between the numen and its attendant body lost its tenacity. I realized that one could be a pile of ashes, hovering as if to crumble with a breath of air, while the other continued shining through its wasted host. Spirit became paramount. It, coupled with the temporal body’s implicit connection to the cycles of life on this planet became my foci. And so, rather than trying to illustrate the human spirit illuminating its pristine bodily form, my work has become about creating physical metaphors for the visceral experience of being one with the planet physically, while at the same time transcending the human body’s earthen home. In doing so I am interested in using materials whose physical integrity mirrors the cyclical life of a human body: other living organisms. Equally fascinating as materials with which to work are the earth’s raw materials – the ever-present resources from which we come together and into which we fall apart: dirt, salt, wax, metal, sand, water, fire (light). These materials may be worked with alone or together. The only rule is that they must not be altered such that they can no longer return from whence they came.